Mickey Mouse is a great lesson that you can truly do anything if you set your mind to it. Since his birth in 1928 Mickey has been a pilot, captain, construction worker, magician, conductor, tailor, philanthropist, and even king on multiple occasions. He is a reminder that the biggest things in the world can start with something so humble as a little mouse. Pretty good for a guy turning 89 this year! 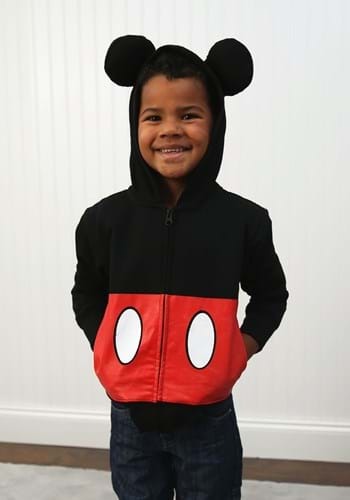 Our officially licensed Mickey Mouse Hoodie will keep your little one happy in a number of ways. Needless to say, they’ll love looking like their favorite mouse with his unmistakable ears and big white buttons. And the 60% cotton, 40% polyester fabric will keep them toasty and warm. This hoodie has all the makings of a childhood favorite and will stay in your tyke’s wardrobe long after they’ve worn it for a costume.